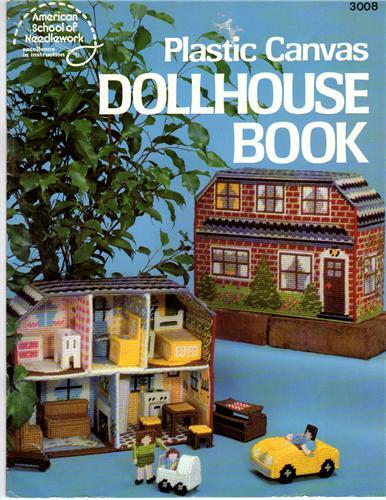 American School of Needlework Plastic Canvas Dollhouse Book plastic canvas pattern booklet. Living Room, Bathroom, Kitchen, Nursery, stove, sofa, chair, crib, buggy, mother, car, picnic table, bed, night table, baby, toilet, vanity, dresser, coffee table, kitchen stool, father, kitchen table, refrigerator. Out of print. Appears new and unused. Price tag residue on cover. Some very minor shelf wear along edges.